Thriving regardless of what life gives you! by Lee H. Baucom, Ph.D.
Are you growing? Maybe you feel “all grown up. But that’s not what I am asking. Are you “done,” or are you in a process of becoming? 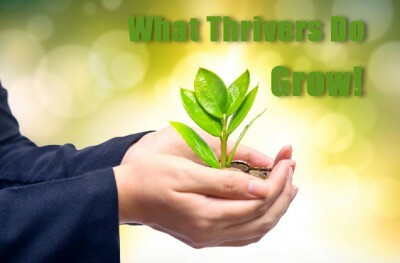 People who thrive continue growing. It is not about always being happy, but forever growing and developing. When the goal is “happiness,” we can get stuck. But when you know the task is to continue to grow, there is always room for that. Thrivers nurture their curiosity. That helps them continue to expand their world. It opens before them. Thrivers know that, while crises don’t happen in order to teach a lesson, one can still learn the lessons from the struggle. Growth is all about being open to the lessons. My name is Lee Baucom. My goal is to help people to thrive. My belief is that too many of us live too little of life.